Safemeds4all.com is a marketing website for Asclepius Universal Ltd. (collectively referred to herein as "Safemeds4all"). Safemeds4all.com is not engaged in conducting sales, but rather engages in the business of facilitating sales transactions on behalf of authorized pharmacies both within Mauritius and internationally. The following terms and conditions (the "Terms of Sale") related to the services and sales as between the Safemeds4all.com authorized Pharmacy (the "Pharmacy") and you (the "Customer") of the products and services (the "Products") offered for sale by the Pharmacy. By accepting delivery of the Products described on a purchase order (an "Order"), the Customer agrees to be bound by and accepts the Terms of Sale. As your authorized agent, Safemeds4all works with the Pharmacy to facilitate orders of Product for your health and well-being. Since you do not reside in the same area where the Products will be coming from, it is necessary for you to authorize Safemeds4all to act on your behalf. By accepting delivery of the Products and services from the Pharmacy you agree to be bound by these terms and conditions of sale (collectively, "Terms of Sale"). THESE TERMS & CONDITIONS APPLY TO ALL TRANSACTIONS, BOTH CURRENT AND FUTURE, INVOLVING THE PURCHASE OF PRODUCTS FROM THE PHARMACY. IF YOU DO NOT AGREE TO THESE TERMS & CONDITIONS, Safemeds4all, AS YOUR AUTHORIZED AGENT, WILL NOT BE ABLE TO FACILITATE YOUR PURCHASE OF PRODUCTS. IF YOU HAVE RECEIVED PRODUCTS WITH THESE TERMS & CONDITIONS, AND YOU DO NOT AGREE TO BE BOUND BY THEM, YOU MUST RETURN THE PRODUCTS WITHIN 30 DAYS BY CONTACTING Safemeds4all AT THE CONTACT NUMBER AVAILABLE ON ITS WEBSITE AT www.Safemeds4all.com (the "Website"). Knowledge and Consent. By placing an order with the Pharmacy via Safemeds4all, you acknowledge that you are of the age of majority, of sound mind, and agree to be bound by these Terms & Conditions with full knowledge and without undue influence or duress. You acknowledge that these Terms & Conditions are readily accessible on the Website and that you have been provided with the opportunity to obtain independent legal advice with respect to these Terms & Conditions. Original Prescription Required. You acknowledge that the Pharmacy will not accept any order unless you deliver a valid prescription issued by Your Own Physician based upon a personal consultation and examination, as referenced in paragraph 2 above or unless Safemeds4all.com receives the original prescription from the Prescribing Practitioner by facsimile. Power of Attorney. You authorize and appoint (a) Safemeds4all and the Pharmacy as your agent and attorney, to take all steps, sign all documents, and act on your behalf as if you were personally present and acting for yourself for the limited purposes of obtaining a legally valid prescription, if required by applicable law, for any prescription which you have sent to the Pharmacy; and (b) packaging the Products and delivering them to you. This authorization shall include, but not be limited to, the collection of your personal and personal health information and the disclosure of such information to the Pharmacy and any other health professionals being retained on your behalf, as required. You may revoke this authorization at any time, but it shall continue until you revoke it in writing. Delivery. Delivery of the Products ordered from the Pharmacy takes place when the Products leave the Pharmacy. After delivery, the Pharmacy will, as your authorized agent and attorney, arrange for the shipping of the Products to your home address. Normally, shipments take an average of 7 to 15 working days to arrive. In the event that shipment of the Products is delayed, and upon notice from you, the Pharmacy will arrange for a replacement order to be sent to you at no additional cost. 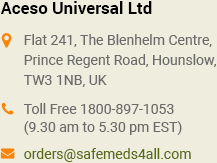 Safemeds4all and the Pharmacy are not liable for any damages suffered due to delay in shipment or failure of the Products to arrive within a specified number of days. EXPORTS It is important to note that not all of the Safemeds4all.com's services shown on the website are available in all provinces in Mauritius or in jurisdictions outside of Mauritius. Please note that the FDA has taken the position that virtually all shipments of Products imported from the Pharmacy by a United States customer will violate United States law. By placing an order for Products or services with Safemeds4all and/or the Pharmacy, you represent to Safemeds4all.comand the pharmacy that sale, delivery, and shipment of the Products will not violate any import, export, or other law or regulation in your home jurisdiction. Warranties. THE MANUFACTURERS OF THE PRODUCTS ARE SOLELY RESPONSIBLE FOR ANY WARRANTY ASSOCIATED WITH THE PRODUCTS. TO THE MAXIMUM EXTENT PERMITTED BY LAW, Safemeds4all DISCLAIMS ALL WARRANTIES AND CONDITIONS, EXPRESS OR IMPLIED, IN RESPECT OF THE PRODUCTS AND SERVICES CONTEMPLATED BY THESE TERMS & CONDITIONS, INCLUDING, WITHOUT LIMITATION, IMPLIED WARRANTIES AND CONDITIONS OF MERCHANTABILITY AND FITNESS FOR A PARTICULAR PURPOSE. RESPONSIBILITY FOR CLAIMS IN RESPECT OF THE PRODUCTS IS LIMITED TO REPLACEMENT OF THE PRODUCTS. Return Policy. Safemeds4all and the Pharmacy do not accept return of Products for any credit unless the Products were dispensed in error contrary to the prescription or a delivery error occurred. Please visit the Website to view the current return policy for Products. Products and Services. Safemeds4all may revise and/or discontinue the services as displayed on the Website at any time, without notice. Force Majeure. Safemeds4all and the Pharmacy shall not be liable for any delay or failure in performance caused by circumstances beyond their reasonable control including, without limitation, delays due to back orders of requested Products, mail delays, customs delays and lost shipments. Although Safemeds4all and the Pharmacy will make reasonable efforts to do so in order to maintain good client relations, Safemeds4all and the Pharmacy are not responsible to notify you in the event of any delay. You shall be solely responsible to make such arrangements or to purchase alternative products. Any such costs incurred in association with such purchases shall be solely borne by you. Governing Law. You understand that Safemeds4all is a marketing company that engages the Pharmacy, in its capacity as your authorized agent and attorney, for the purpose of facilitating the purchase of the Products. Title to the Products pass to you when they leave the Pharmacy. All agreements reached or contracts formed shall be deemed to have been made in the jurisdiction of the Pharmacy, and the laws of that jurisdiction shall have sole and exclusive jurisdiction over any dispute arising between you and the Pharmacy and/or under these Terms & Conditions. Parent/Legal Guardian. In the event that you have placed the order for a child or a dependent, you have confirmed for Safemeds4all and the Pharmacy that you are the parent, legal guardian and/or have power of attorney for the customer, with full authority to sign for and to provide the above representations to Safemeds4all and the Pharmacy on the customer's behalf.